FedEx Tracking. Delivery Tracking System for FedEx. Do not use spaces or other (+ - / * ? & = ! ') characters. After clicking on the "Track" button on the left, you will be directed to the tracking result page on www.fedex.com. This page creates just a link automatically for requested information with form restructuring. The most common tracking number format is 12 digits (e.g. 9999 9999 9999) or 15 digits (e.g. 9999 9999 9999 999). Some other less common formats may also exist, such as 20 digits and 22 digits. Online Tracking Numbers COM never makes logging and does not use FedEx's any of the information system definetly. FedEx (Federal Express) is an international express and mail services company with headquarters in United States. FedEx also provides express service within United States. FedEx Tracking, You can find a shipment no at the voucher that you get from FedEx, by your shipment. You can follow your post. Tap the shipment no on the site and immediately see where your package is at the moment, day to day. Package tracking is achieved by redirecting your inputs to related FedEx tracking service query addresses. Your private information such as your tracking numbers, cookies, session information are not logged in our site. FedEx Corporation is an American global courier delivery services company headquartered in Memphis, Tennessee. The name "FedEx" is a syllabic abbreviation of the name of the company's original air division, Federal Express, which was used from 1973 until 2000. FedEx is organized into operating units, each of which has its own version of the wordmark designed in 1994 by Lindon Leader of Landor Associates, of San Francisco. The Fed is always purple and the Ex is in a different color for each division and platinum for the overall corporation use. The original FedEx logo had the Ex in orange; it is now used as the FedEx Express wordmark. The FedEx wordmark is notable for containing a subliminal right-pointing arrow in the negative space between the "E" and the "X", which was achieved by designing a proprietary font, based on Univers and Futura, to emphasize the arrow shape. FedEx Express (Orange "Ex"): The original overnight courier services, providing next day air service within the United States and time-definite international service. FedEx Express operates one of the largest civil aircraft fleets in the world and the largest fleet of wide bodied civil aircraft; it also carries more freight than any other airline. Caribbean Transport Services: Until 2008, a part of FedEx Freight. Provides airfreight forwarding services between the US mainland, Puerto Rico, the Dominican Republic, and other Caribbean islands. FedEx Ground (Green "Ex"): Guaranteed day-definite delivery within Canada and the United States at a cost savings as compared to time-definite FedEx Express. Uses a large fleet of trucks which are owned by the independent owner/operators and drivers are independent contractors who control individual delivery routes and territories. Formerly Roadway Package System (RPS). FedEx Home Delivery: A division of FedEx Ground, specializing in residential delivery Tuesday through Saturday and offers delivery options to provide more flexibility for residential recipients. The logo includes a drawing of a dog carrying a package . FedEx Home Delivery only operates in the United States. In the US it is not uncommon for Home Delivery packages to be delivered by stander Ground trucks, supplying no additional services for the up charge. To make up the difference, FedEx Ground in Canada performs the business deliveries and residential deliveries. FedEx SmartPost (Platinum "Ex"): Consolidates parcels from merchants such as e-commerce and catalog companies and uses the United States Postal Service for the final delivery. Formerly the independent company Parcel Direct until FedEx acquired them for $120M in 2004. FedEx Freight (Red "Ex"): Less than truckload (LTL) and other freight services. The second largest LTL carrier in the United States, with $4.5 billion in revenue for 2008. FedEx Freight, Inc: Formerly American Freightways, Viking Freight, and Watkins Motor Lines. FedEx Freight Canada: Formerly Watkins Canada Express. FedEx Custom Critical: (Red "Ex") Delivers urgent, valuable, or hazardous items using trucks and chartered aircraft. Freight not accepted for transport includes perishable food, alcohol, livestock, household goods, hazardous waste and money. Drivers are independent contractors who own their vehicles. Service in Mexico uses interline carriers. Formerly Roberts Cartage or Roberts Express. FedEx Trade Networks (Yellow "Ex"): Provides services relating to customs, insurance, and transportation advice. Formerly C.J. Tower & Sons, then Tower Group International. FedEx Supply Chain Services (Platinum "Ex"): Provides logistics services including Critical Inventory Logistics, Transportation Management Services, Fulfillment Services, etc. Formerly Roadway Logistics System, then Caliber Logistics. FedEx Corporate Services (Platinum "Ex"): Provides global marketing, planning and information technology (IT) services for the other FedEx operating companies. FedEx TechConnect: Offering a customer service toll-free telephone line for customer questions. It is operated by an automated operator then will prompt the user to a live agent for uses of tracking, claims, scheduling pick-ups (Express, Ground, Same Day, Custom Critical, Freight Express, and Freight LTL), compliments and complaints, locations (both staffed counter locations and drop-boxes), ordering supplies, setting up FedEx accounts, billing etc. Formerly FCIS or FedEx Customer Information Services. If you have any question regarding the delivery process of a package, call: +1 800 247 4747(US) or +44 2476 706 660(UK). Courier Companys automatically assigns a tracking number to your shipment. Tracking numbers are numbers given to packages when they are shipped. Tracking numbers are useful for knowing the location of time sensitive deliveries. FedEx Tracking numbers are used by FedEx to identify and trace shipments as they move through the FedEx system to their destination. 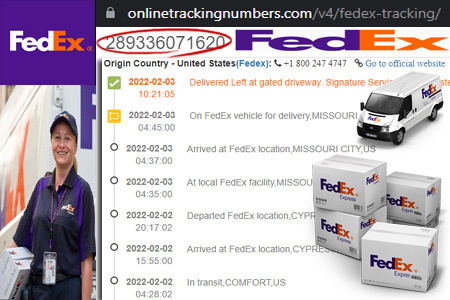 By log in your FedEx Tracking number can you your package ID by entering the detailed information online following, you can know where your package is at the moment. boypuloh: Tracking this fedex parcel forever!! !